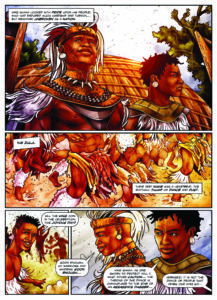 Shaka’s story continues in 2019 with King Shaka: Zulu Legend, the next edition of the African Graphic Novel Series. Shaka has fought his brother to the death for rulership of the Zulu. Now king of the southern chiefdoms, Shaka seeks to uplift his people, consolidate alliances, and expand the reach of his power, but challenges both external and internal threaten his rule. A rogue military unit exacts revenge on its enemies. Land-hungry Europeans arrive and ingratiate themselves with Shaka, even while plotting their own path to power. And closer to home, Shaka’s own brothers conspire in secret. Luke Molver is a graphic novelist whose world is fueled by the art of storytelling.